Have your artwork featured on the cover of the UK’s first report of progress towards the Global Goals (also known as the Sustainable Development Goals or SDGs). The UK is reviewing its progress towards the Global Goals. The Goals are part of the United Nations 2030 Agenda for Sustainable Development – a global agreement to eradicate extreme poverty and make the world a better place by 2030. We will submit this review to the United Nations in the form of a report called the Voluntary National Review. This is the first time the UK has prepared a Voluntary National Review and it will be presented to the United Nations in July 2019, at the High Level Political Forum. 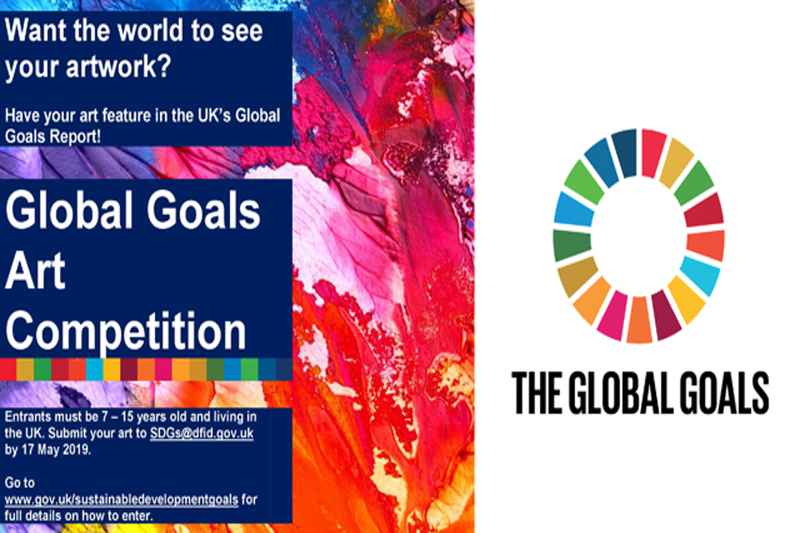 This competition is an opportunity for young people aged 7 to 15 years old across the UK to show us what the Global Goals mean to them and have the opportunity for their artwork to feature on the cover of the Voluntary National Review. To enter, please follow the guidance in the Terms of Reference (PDF, 251KB, 3 pages) . The deadline for submitting artwork is 9:00am on 17 May 2019. The artwork must be A4 in size, scans or photographs of the artwork must be submitted in high resolution format (e.g. PNG / JPG) and you can only submit one piece of artwork per child. All entries must be submitted to SDGs@dfid.gov.uk . For more information about the UK’s Voluntary National Review, please visit the Voluntary National Review page. 15 April 2019 First published.